Yesterday I got an email from a company who has released a trailer of a documentary about the last interview given by Thomas Szasz. The trailer can be viewed here. 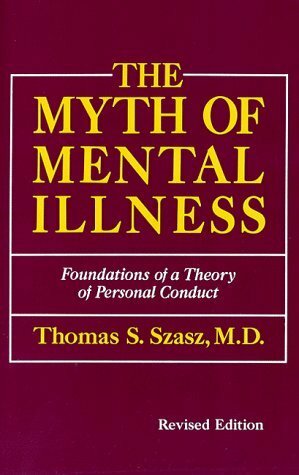 To catch many of you up, Thomas Szasz was the radical and iconoclastic psychiatrist who spent most of his life attacking the profession of psychiatry by arguing that "mental illness" did not exist. Rather, Szasz argued, "mental illness" was a social construct created so that society could use it as a form of social control via the medical and legal professions. 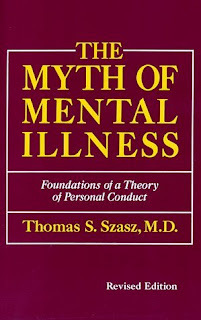 According to Szasz, mental illness was a myth as he wrote in his famous book The Myth of Mental Illness, published in 1961. I read Szasz when I was getting my Masters degree in Clinical Psychology. Szasz blew my mind. The Myth of Mental Illness is a wonderfully subversive book, one of those classic radical reads from the 1960s. Szasz argues that mental illness is a social fiction that is used to mask moral conflicts within society. Crudely, behaviors we don't like we label "ill." Behaviors we like we label "healthy." We then use the medical profession, backed up by the state, to regulate social behavior. To be sure, this is a radical vision that I think Szasz pushed too far. Still, Szasz opens your eyes to just how socially malleable, and exploitable, is this notion of "mental illness." Consider, for example, how mental illnesses come and go. Take hysteria as one historical example. Sigmund Freud cut his teeth on treating hysteria. Freud's first significant work, penned with Josef Breuer, was Studies in Hysteria. This is the book with the famous case of Anna O., the patient who birthed the "talking cure" and launched the modern psychotherapy movement as we know it. Anna O. (Bertha Pappenheim) suffered from hysteria, a odd assortment of neurological and psychosomatic symptoms, that was common at that time. Breuer and Freud would hypnotize hysterics talking them back to the origin of the symptoms and, once that had been done, the symptoms would often relieve themselves. Freud eventually ditched the hypnosis and began to use "analysis" to talk back to the root of the ailment. But here's my point. Where have all the hysterics gone? To be sure we still have psychosomatic disorders, but the particular constellation and prevalence of what Freud diagnosed as "hysteria" has gone away. Hysteria was a mental illness that had its day and then vanished. Half-jokingly, I tell my college students that dehydration is the hysteria of the modern era. Everybody, it seems, is dehydrated in a way that seems very psychosomatic. The slightest physical symptoms are quickly traced back to not drinking enough water. I see students on my campus carrying around large jugs of water like magic talismans in their constant efforts to ward off the specter of dehydration. I point out to my students that when I was growing up no one was dehydrated. We never heard it talked about or worried about it. No one, growing up, complained about dehydration. So what happened? Bottled water happened. Dehydration only became a chronic worry after bottled water appeared. I remember the first years of bottled water. Many of us were incredulous. Really, we thought, you're going to sell water? To whom? And you are going to make water the same price as, say, a Coke? That'll never fly, we reasoned. You can get water for free from the tap. Shoot, we used to drink out of garden hoses when were playing outside. Why would anyone pay for water? And shouldn't water be, at most, half the cost of a Coke? Well, I totally missed the boat on that. Bottled water is now ubiquitous. And it costs the same as a Coke. And with the ascendance of bottled water came the never-before-heard-of worries and complaints about being dehydrated. The lesson? This: Our physical and mental symptoms reflect our times. Jesus had demon-possession. Freud had hysteria. We have dehydration. This is why the publication of the DSM is so contested and controversial. If you don't know, the Diagnostic and Statistical Manual of Mental Disorders is the bible of mental illness diagnoses in the United States. It is published by the American Psychiatric Association. The 5th edition of the DSM has just been published, which is a pretty big deal in my field. When the new DSM arrived at our offices we all gathered around to check it out. Nothing more fun than flipping through the DSM with a bunch of psychologists. The reason the DSM is so contested and controversial is that here is a book that defines the boundaries between "sick" and "well," psychologically speaking. And unsurprisingly, lots of people have opinions about that boundary. 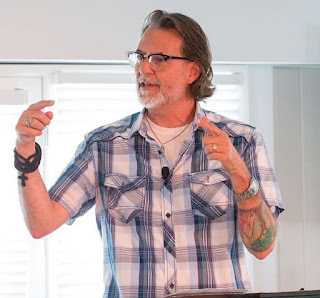 This boundary is often hotly contested between religious groups and the mental health community, one reason many churches don't trust psychologists or psychology. For example, on our own campus our psychology majors will occasionally receive worried comments from bible professors or from people at their church. Why this anxiety? Because a particular religious group who defines a behavior as "sinful," "unnatural" and even "harmful" can get "overruled" by the mental health community (through things like the DSM) who steps in to declare the behavior in question as "normal" and "healthy." So a turf battle ensues about the boundaries of mental illness and moral approbation. This boundary wouldn't be so contested if, in fact, the boundary didn't shift very much. But it has. Behaviors that the DSM used to classify as a "disorder" are now no longer so classified. And new disorders are created for things that once were considered normal. A kid used to be fidgety. Now she has ADHD. As Szasz noted, what is or is not an illness shifts with society and we should pay attention to how society is using the category "mental illness." Take another example, depression. Depression used to be called melancholia, and the ancients actually found melancholia to possess some personal and social benefits. Realism, for instance. For example, some have argued that one of the reasons behind Abraham Lincoln's greatness and kindness was that he suffered from chronic depression (and even suicidality as a young man). That struggle with depression, it is argued, gave Lincoln the psychological resources to deal with the early setbacks of the Civil War along with the empathic capacity to bind up the wounds of the nation in the face of suffering and tragedy. Depression has some benefits. Does that mean that depression isn't a black hole of despair and pain? No. But calling depression an "illness" may obscure the ways that depressed people have advantages, capacities, insights and skills relative to the non-depressed. Maybe depression wouldn't sting so bad in our modern era if we turned toward the melancholics, like the ancients did, for insight, wisdom, perspective, and guidance. Depressives also tend to make better art. Let's also go back and reconsider that ADHD diagnosis above. Think of attentional capacities as existing, like many natural phenomena, on a bell curve. Some of you have amazing attentional abilities. You can read a book in the middle of a maelstrom. But for every one of you there is, because this is a bell curve, a person who is distracted by the smallest stimuli. For these people, attention is a struggle and a chore. Think, then, about those children in a classroom who are, of statistical necessity, at the bottom 10% of attentional abilities. Are these kids the ADHD kids? Are they sick or ill? Do they have a disorder? Or are they just natural variants along the attentional ability continuum? There are tall kids and there are short kids. There are kids who can attend and those who cannot. Why, then, call the bottom of the curve disordered? Why do they need a diagnosis? This isn't to say that those kids at the bottom aren't struggling with attention. This isn't to say that those kids don't need to learn to cope with with their situation or that psychopharmacology can't be of help. Shoot, I drink coffee--a stimulant--to pay better attention. So we are not denying that there are kids who struggle with attention and that they might need some help. What we are questioning is if it's a good idea to give these kids a "diagnosis." Is it healthy to have the word "disorder" as a part of your self-description at a young age? Which brings me back to Szasz. There is no doubt that we suffer psychologically in various ways. I don't think psychological suffering is a myth. But I do think the notion of "mental illness" is, very often, a metaphor. And like all metaphors it can be used well or poorly. The metaphor of "mental illness" used well can promote sympathy, care and nursing. Because we generally rally around sick people. And yet, this same metaphor can be misused, becoming a location of shame, helplessness, stigmatization and exploitation. And this, I would argue, is the value of reading someone like the radical Thomas Szasz. Pay attention to the metaphor of mental illness, the language of diseases, addictions, disorders, diagnoses, treatments, therapies and so on. It's not wrong to call something "mentally ill" but great care and caution is needed. oh bottled water. That is such a perfect example! I don't carry a water bottle everywhere and I just drink when I'm thirsty. My dad was a school principal at the height of the ADD craziness. He used to tell parents, if your kids can sit and watch TV-they don't have ADD. Guess what- a bit majority of them could and did. I can't say that I wouldn't medicate if one of my children had ADD but I like your explanation in this post. 1) Was watching a West Wing rerun where, in scoring political points, someone says, "hey, calling drug use a disease isn't an opinion, it's science." It's dangerous, politically, for any party/ church/ person to be "against science." 2) Dehydration was, I think, a poor example. I don't think it's psychosomatic; I think bottled water and dehydration are both caused by another cultural shift. Basically, a generation has grown up drinking so many sugary drinks that they don't naturally spend any time at the water hose, kitchen faucet, or bathroom sink). They really do get dehydrated, because they don't know how to drink anything without sugar in it. Bottled water then becomes a sort of "medicine" that they tote around (but still don't don't drink as much as they would from a water hose, kitchen faucet, or bathroom sink). 3) You say the metaphor can be used well or poorly, but emphasize more the negative stereotype of calling these things a disease. But I've found that it's very, very comforting to think of my depression, attention problems, or addictions as a disease. It validates my sufferings, makes me feel like it isn't my fault, makes me feel like I'm part of something bigger (a "disorder"), and makes me feel like I can adjust expectations to a level that doesn't put as much pressure on me. That might be one reason many people have always fought so hard for the "disease" label. To me, the reason for diagnosis or disease as a descriptor is because without it there is no treatment. If I am in the bottom 10% and struggling with attention, I don't get adderall or ritalin to help me unless I have an "illness" that necessitates it. Our culture does not offer treatment to enhance or improve individuals. In fact they deem it unethical. Our culture requires that you have a label, a diagnosis, an illness before you can receive any help. Richard, I think your point is well taken and that we should employ the metaphor, as you call it, of mental illness with great care. I think it is wise and in line with the teachings of Christianity to call into question boundaries of exclusion that are drawn--what we are calling disorders or diagnoses--which can lead to marginalization and shame. My concern is that this move that you, and more specifically Szasz, are making could lead to an out of hand dismissal of the millions of people among us who have been given a mental health diagnosis. Putting aside for a moment how people came to be diagnosed, the daily reality for many of those diagnosed is one of shame and exclusion due to the stigma and misunderstanding that surrounds mental illness. To skip to the understanding you’ve outlined without taking care to reconcile with those who’ve been marginalized and wounded seems irresponsible and further damaging, a dismissal of their painful experiences. I’m fully aware that you are not being dismissive, but I think that this needs to be stated lest others are tempted to use this line of reasoning as another tool to marginalize. Hi Alan, I think that's exactly what I'm advocating. Treating people as human beings, as they stand before us exactly as they are, without sorting them into "sick" vs. "ill," without "diagnosing" them. This isn't to deny the existence of their suffering or the challenges they face but is, rather, an attempt to strip away the medical filter to see their suffering in uniquely human terms and, as I'm keen to point out in the post when I spoke about depression, something that can contribute to my life and the world. The profession of psychiatry has changed enormously since the time that Szasz began writing, mostly in good ways. Some stigma has abated; the sense of shame that once kept most people from ever speaking of seeing a “shrink” has greatly lessened. But casting doubt on the lived reality of mental illness continues. It’s a newer form of stigma that presents itself as intellectual sophistication. It permeates journalism, in particular, and speaks itself every time we write stories that parse “true” depression (the suicidal kind) from the whiny, self-indulgent, unjustifiably overmedicated, “mild” kind. It comes up every time we trivialize ADHD as a pseudo-affliction of “wiggly boys” or ambitious high school students who want to drug themselves up to get better grades. This pernicious form of stigma has become second nature for many right-minded people eager to prove their independence from the machinations of the hand-over-fist-money-making drug companies. Yet it’s a form of social protest that, long removed from its valid historical roots, has become simplistic and sometimes even harmful. It’s time to give Szasz his place in history. And then to move on. Thank you for sharing your story. Your ending words are beautiful: "when we define a thing we give it limits..." (I feel this way about God), and this: "When we limit a child, even out of love, we do far more damage than we can ever realize" really got to me. How I wish parents would trust their intuition about their children and keep in mind that, as Richard points out, there is a continuum and we are all part of the bell curve. I'm with Barb, thanks so much for sharing this. It's way better than my post. Well said, Richard. And after spending considerable time with your blog I am fully confident that this is your intent, but I've found that most people are not as thoughtful and inclined toward seeing the humanity of others. As someone who lives with bipolar disorder and works in community mental health I do wonder if it's too simplistic to strip away the medical filter entirely. The medical filter, for all it's downfalls, did give me a framework, vocabulary, and set of treatments with which to manage the events and symptoms that upended my life. I see the same in my day to day work. My hope is that there is a way that we can hold to the benefits of the medical filter without collapsing people's identities into their diagnoses. Yes, very much agreed. 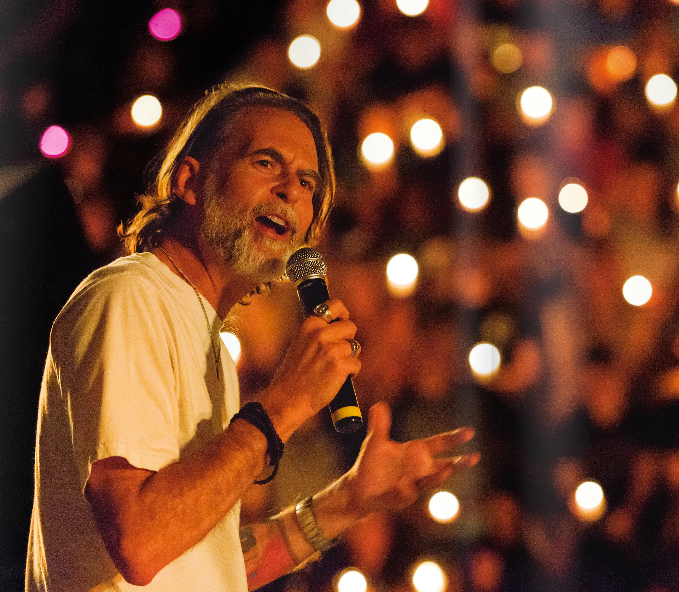 At the end of the day, no matter how you do it, we should lean into human suffering. And the medical profession, psychiatry included, does this. That's why most people go into mental health. I think a lot of it depends on who gets to apply the labels, which is maybe reflected in the other comments on this thread. It can be useful to be able to call yourself depressed, for example; I've learned that this can help place my own cognition and behaviour, which in turn helps me place myself. And how do you convincingly call your depressed without a diagnosis? But I think Szasz is also right to say that the label "mental illness" can be used by the medical establishment (oh, that nefarious cabbal) to further silence already marginalized people (though I come to this more from Foucault than from Szasz). What concerns me, then, is how this works with children, who probably can't apply labels to themselves in empowering ways. The best they can do is try to use the labels they've been given, and there's not a lot of power there. I throw this out there to offer a widely different take on the discussion. Whether a diagnosis, disorder, metaphor, or myth, the *behaviors* that may be classified as mental illness have been defined largely by physicians, psychologists, and research scientists. There is a need in the medical/research/scientific community to try to the best of their ability to systematically classify and identify groups of things....in this case, they try to classify and group behaviors as a "disorder" or "disease" in ways that prove informative and predictive. This, by definition, will obviously create in/out groups...people that are "normal" and those that "differ" from normal. As with any approach, the rules and classifications can be fuzzy and lack reproducibility - especially when the symptoms will vary greatly and the causes are often poorly defined as well. This results in diagnoses that can occasionally fail to be informative and lack predictive qualities. This is where the danger arises. As I understood, a large part of the desire for an update to the DSM was to get a better handle on the classifications of certain disorders so that research into those areas would be better served. So many "mental illnesses" remain poorly defined that it's hard to find agreement among doctors/scientists. This causes confusion, creates turf battles, and ultimately blocks funds from going to people to do more research that might actually HELP clarify boundaries in ways that improve the overall situation. It's a challenging area because we do need to exercise great care in placing labels on people. Those labels, however, provide a framework that can (in an ideal situation) offer predictive qualities and thus provide earlier help. Lol. I actually grew up in a country where running water was not provided by the government, and clean water had to be provided by "free market" mechanisms (including lots of generosity). We were always grateful for the healthy "socialism" we found when we returned to the USA. Elaine Pagels has this idea that satan came about in order to distinguish between us and the enemy, and the same demons and demonization. I'm not finished with Pagel's book yet, but she linked those two together in a sobering way I hadn't thought of before. What's the balance between demonizing and dehumanizing and fighting an enemy (As you've talked about with warefare/weakness). Maybe it's using those ideas while being careful not to outcast, to accept and encourage rather than reject. To forgive and leave room for hope rather than forgive with a stipulation or agenda. Maybe that's to truly live to the virtue of love. I have some more to think about in relation to how the NT talks about satan and demons and that relation to dehumanization. Thoughts? And I think intervention in addiction treatment centers is really an orchestrated dopamine reward experience strong enough to cause the person to agree to their -ism long enough to graduate from treatment and go to a 12 step group. Rather than pushing too far, Szasz advanced his critique into many new areas over the years, and his reasoning was always erudite and airtight. His writing became more elegant and incisive over time, with this best books appearing toward the end of his remarkable life. Most highly recommended are: "Psychiatry: The Idea and Its Consequences," "Cruel Compassion: Psychiatric Control of Society's Unwanted," and "The Meaning of Mind." Szasz will earn a place as one of the great intellectuals of his time, and one of history's most important moral philosophers. Sixty years past the publication of "The Myth of Mental Illness" there is still not a single psychiatric diagnosis that can be confirmed scientifically by a biological or anatomical test. Psychiatry continues to consist of the labeling of disapproved behavior and the provision of pseudoscientific explanations for genuine diseases whose actual causes have not been found. When a behavior is no longer disapproved, the diagnosis of mental illness evaporates. (e.g., homosexuality) When a condition is found to have a genuine biological basis, it is no longer a psychiatric disorder. (e.g., epilepsy) Psychiatry offers bogus diagnoses of fake diseases and misdiagnoses of real diseases. "Jesus had demon-possession. Freud had hysteria. We have dehydration." Gosh, but your blog is thought-provoking. I learn something new every time. The more things change, the more they stay the same! Thank you, once again, for pulling ideas together from theology, psychology, biology, sociology, history, anthropology and whatever-else in creative ways that are truly satisfying to reflect upon. They respect the complexity of our shared humanity rather than offering up simple explanations and solutions. As Milan Kundera writes, "Metaphors are dangerous. Metaphors are not to be trifled with." I really like the idea of the illness metaphor for depression, etc. Coincidentally, I just listened to a two-part CBC Ideas podcast on "Rethinking Depression." In it, one of the interviewees remarked that we've given Ritalin to boys to calm them down and SSRIs to women to perk them up to get everyone at a culturally ideal middle ground. Just one of many interesting things that were said. No other medical specialty claims the authority to treat people by force. Until psychiatrists eschew violence, they are tormentors, not helpers. Are drugs help? If so, then why is it illegal to help one's self? Why were Americans stripped of their traditional right to self-medicate? The issue is power, not suffering. Thomas Szarz does not seem to have considered the people suffering from mental illness who are homeless, end up in jail, commit suicide. He needed a good psychiatrist. What blod, urine, or MRI test confirms grief? The scientific method is not the only form of diagnosis. You think you know something, but you dont. Grief is an emotion, not a disease, and that is the point. The medicalization of emotion is the essence of dehumanization. Just tonight on PBS there was a program about Chinese kids who are sent to "boot camp" because of their Internet "addiction." On of the imprisoned boys put it perfectly. "It's not a real disease. It's a social phenomenon." Sad that a Chinese teen can see it, but so many Americans cannot.